This eggplant casserole is a fast and easy preparation with lots of flavor. 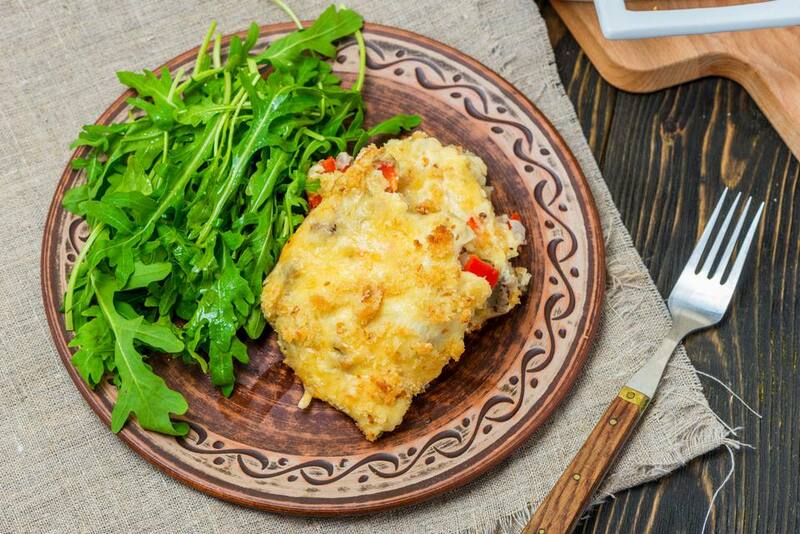 The eggplant is cubed and cooked with a tasty combination of cheese, eggs, bread crumbs, garlic and chopped vegetables. Feel free to add some mushrooms to the eggplant casserole, or change the type of cheese. Monterey Jack cheese, fontina, or another kind of melting cheese may be used. Grease a 1 1/2-quart casserole. Put eggplant cubes in a colander and sprinkle with salt. Let drain for about 5 to 10 minutes. Put in a saucepan and cover with water. Bring to a boil. Reduce heat, cover, and simmer for 8 minutes. Drain well and add 1/4 teaspoon salt, the pepper, and the garlic. In the empty saucepan, heat olive oil over medium heat. Add onion and saute until just softened. Add the bell pepper and continue cooking until the bell pepper is tender. Stir into the eggplant mixture. Stir the beaten egg, 1/2 cup of breadcrumbs, and 1 cup of Cheddar cheese into the eggplant mixture. Sprinkle the remaining 1/2 cup of cheese over the casserole. Combine the melted butter with the remaining 1/2 cup of breadcrumbs. Sprinkle buttered breadcrumbs over the cheese layer. Bake for 25 to 30 minutes, until browned and bubbly around the edges. Overly mature eggplants can be bitter. Choose an eggplant that is firm to the touch with no soft spots. The leaves on the end of the eggplant should be green, not brown and dry.